(From Canon lens literature) Compact and affordable, the EF-S 18-55mm f/3.5-5.6 IS is the ideal general-purpose standard zoom. Its 4-stop Image Stabilizer provides great performance in low light conditions. Canon dropped an early Christmas present with the announcement of this consumer-level lens. As an upgrade from the 18-55mm ƒ/3.5-5.6 USM EF-S lens that is bundled as the standard ''kit'' lens with many Canon dSLR cameras, many Canon photographers may be looking to Santa longingly. And Santa's budget may not be pushed too far, with an announced price point of $199. The real news here is the inclusion of Canon's image stabilization, typically seen only in higher-end glass. With a touted performance of four extra stops, it should make a real difference in the photography of the average user. 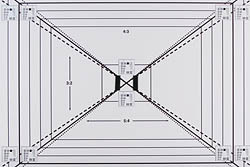 Canon digital SLR cameras with sub-frame sensors have a ''crop factor'' of 1.6x. Thus, for this particular lens, it will exhibit an effective focal length of 29-88mm. The lens takes 58mm filters, and a lens hood is indicated as an optional accessory. Of course, the terms ''minimum'' and ''maximum'' can be confusing when it comes to discussing aperture, so in this case the intention is that ''minimum'' refers to smallest f-stop number, while ''maximum'' refers to largest f-stop number. The blur graph shows a remarkable improvement from the non-IS 18-5mm ƒ/3.5-5.6 lens; it's interesting to note the only real change (according to the specifications) between the two lenses is the addition of an aspherical lens to deal with the effects of chromatic aberration. The sharpness performance improves at ƒ/3.5 as you zoom out the focal range and stop down, achieving its optimum sharpness at 35mm and ƒ/5.6. Diffraction starts to set in around ƒ/16, but you don't really start to see mediocre performance until the aperture is stopped down to rarely-used f-stop numbers such as ƒ/29. At that point, the image is quite soft, but at least the softness is uniform at between 4 and 5 units. All in all, excellent performance. Chromatic Aberration was a problem on the predecessor to this lens, but the inclusion of the aspherical lens appears to address the issue the lens widest focal length (18mm). When the aperture is set to between ƒ/3.5 and ƒ/5.6, you have radically improved resistance to CA, showing only around 6-7 1/100ths of a percent of CA, compared to between 10 and 12 1/100ths of percent with the previous model. At all other focal lengths and apertures, the CA performance is about the same, which is to say that it is signficant until about 35mm, where it becomes tolerable at between 4 and 7 1/100ths of a percent. So, Chromatic Aberration is not completely eliminated (that would require a more expensive lens design) but for the aperture and focal length that this lens will typically be used at, it is remarkably reduced. We're not talking huge differences here, but the 18-55mm ƒ/3.5-5.6 IS actually has a (very) slightly worse profile when it comes to shading in the corners. You really see it on either lens when zoomed out to wide angle (18mm) where you're looking at a half-stop of light lost. As you approach 35mm this effect is reduced, and you see no more than one-quarter of a stop being lost; above 35mm, the effect is negligible. Distortion is typical for a wide-angle zoom lens; lots of barrel distortion when zoomed to wide (18mm), approaches no distortion in the middle, and gets a bit of pincushion distortion at the telephoto end. At its worst, distortion is almost one percent. 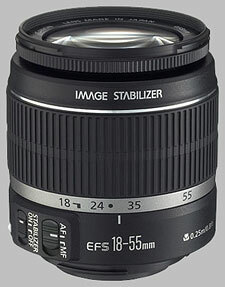 With the 18-55mm IS, the distortion is fairly linear, and meets at the zero-distortion level at around 40mm. You can turn your curves back into straight lines easily with most image processing software. Comparing this to the previous 18-55mm model, the distortion was less linear; there isn't a point where the barrel distortion aligns neatly with the pincushion distortion (they overlap closest at around 28mm). Autofocus performance is fast and quiet, with the whole lens racking through its focus in just under one second. While focus performance is going to depend alot on the body the lens is mounted to, on the digital Rebel Xti I sampled the lens with, I didn't have a single problem with focus, and focusing between points was lightning quick. With a close-focusing distance of just under 25 centimetres (9.8 inches) from the image sensor, the 18-55mm ƒ/3.5-5.6 IS focuses on objects literally millimetres away from the end of the lens. The 18-55 ƒ/3.5-5.6 IS isn't classed as a macro lens, as its 1:2.9 magnification rating (0.34x) suggests. To look at the non-IS version of the 18-55mm fƒ/3.5-5.6 lens, there isn't much difference between them; they're both very light lenses, made of plastic construction. The IS version has changed the zoom dial grip texture; arguably, the non-IS version was just fine, but with the new grip there's no confusing the two. Both lenses have a gasket seal by the lens mount, but it's plastic all the way - however, this probably accounts for the low price of the lens. The IS version of the lens is perhaps 2mm longer, to fit in the new aspherical lens and moving lens element that is used for image stabilization. In practice, the image stabilization really works. We haven't hit upon a scientific method for quantifying image stabilization, but I wouldn't be surprised if the lens lives up to Canon's claims of up to four extra stops of performance. This extra speed is useful in situations where you'd rather use image stabilization instead of a higher ISO. I have to admit I'm surprised to see image stabilization on a lens of this focal range; typically you see IS on zoom lenses, as the effect of camera shake is more pronounced on a telephoto lens. Manual focusing with the 18-55mm ƒ/3.5-5.6 IS isn't great, as the small focus dial at the front of the lens goes through the entire focus range in only a quarter-turn, so there's little room for high fidelity. Not that you will probably need to do much manual focusing with this lens, anyway. Canon is notoriously stingy with its lens products: a lens hood and pouch are sold separately. The lens hood is a bowl-style hood that reverses for easy storage. This is the most obvious comparison, and it's a fairly easy one. The IS version beats the non-IS version handily, especially in sharpness, but noteably in distortion and resistance to chromatic aberration. Adding image stabilization makes it very much worth the extra pennies. Coming in as the low-cost leader, we haven't tested the Sigma option in this category. User reports on this lens are mixed, suggesting a slow autofocus speed and mediocre image quality. We haven't tested the Tamron offering, and there isn't a lot of data from our user reviews, but from the sounds of it, there isn't much of a reason to go for this lens when the regular Canon 18-55mm costs about the same. Zooming out a little wider and farther, the 17-85mm is also an image-stabilized lens, perhaps a little more versatible, but only slightly improved in the aspect of sharpness; resistance to chromatic aberration is tolerable (noticed most at wide-angle), but distortion and vignetting leave something to be desired. This increased capability and versatility is reflected in its significantly higher price. On the other side of the price spectrum, the 17-55mm goes a hair wider, but also features image stabilization. That's where the similarities end; with a constant ƒ/2.8 aperture and a lens profile that's head-and-shoulders above the 18-55mm, it's a lot more expensive, but there's no question you get what you pay for with this lens. The Canon 18-55mm ƒ/3.5-5.6 IS EF-S lens is a remarkable upgrade to the standard kit-style lens. Even if you're not interested in the image stabilization that's been added, the addition of the aspherical lens element (and whatever other fine-tuning the lens wizards have been up to in the lab) shows off improved sharpness and resistance to chromatic aberration. Definitely worth the upgrade. Good as a kit lens, but I wouldn't buy it otherwise unless I had no other choice. I spent almost no time upgrading mine to a 15-85mm. Not a bad kit lens or starting lens to have as it performs above average although it is not exceptional in any one thing. I recently reviewed by photo collection and saw that among my personal favorite photos this lens took a lot of them. A great starter lens capable of taking decent enough photos until you need a lens capable of lower light shots. Taken the first day of owning the camera, I was surprised by the image quality. Build quality is cheap, the little silver sticker above the focus ring has fallen off from use, but is pure cosmetic. This lens came with my T2i. I used it in Europe and Corsica and found the images to be good, but I also was using a 24-105 L at the same time and the images from it were always better, obviously. I also have owned the first generation 18-55mm without IS and could not really tell a difference in the quality, build-wise or optically. I thought this lens was good, but not good enough to keep. I sold it and ordered the Sigma 18-50mm f2.8-4.5 OS HSM, another entry-level midrange zoom. I wasn't able to do a direct comparison but I feel that the Sigma outperforms the canon in most areas, except CA and color balance. I've come to realize I use CPL and grad filters all the time and the sigma allows use of these with its non-rotating front element, and this makes a HUGE difference for me in terms of getting the pictures I like to take. My copy of this canon lens also had a terrible zoom ring that was loose around 35mm and tight and difficult to adjust around 18mm and 55mm. The focus ring is a joke. If you need a knock-around lens that delivers great photo quality, don't bother with other entry-level lenses from third-party makers, because this canon will deliver sharp, contrasty photos. But if you need advanced features and build quality along with equal photo quality, the Sigma 18-50mm f2.8-4.5 OS HSM is a better choice. it is a zoom lens but it's small and light. For what you get, this lens is a steal. The image quality blows away all the other 18-* kit lenses. The IS works great, 4 stops is entirely possible, and the focus is just as fast as early USM lenses, despite not being USM. The lens is a little soft in the corners at full zoom, but in the center, the performance is surprisingly good, even with compared directly with my 50mm f/2.5 macro. In terms of just image quality, you'll have to pay A LOT more to get a little bit better image. If you don't need the durability of a professional grade lens, this is an outstanding upgrade from any of the earlier rebel kit lenses, most notably the non-IS precursor to this lens. The only real downside to this lens, as compared to its expensive counterparts like the 17-55, is the rotating front element. Especially at the wide end, it would be nice to be able to use a circular polarizer AND the lens hood for landscape shots, and the rotating front makes that a PITA to achieve. I must say that even though the build quality is almost the same, image quality is better. I picked up a "used" copy of this lens in new condition for $80 on ebay, and so far I couldn't be happier. The lens is sharp wide open; stopped down it is nearly indistinguishable from the $700 17-40L I used to own. Color and contrast are excellent, and lens flare and chromatic aberrations are well-controlled. Autofocus is very accurate, though somewhat slow and noisy. The front filter thread rotates during both AF and MF, complicating the use of polarizers, gradient filters, and rectangular systems. IS performance is good, by my estimate ~2-3 stops. Construction quality is terrible, as expected for the price. The plastic mount doesn't inspire confidence in the lens' longevity. The zoom ring is neither smooth nor well damped, requiring more effort to turn near 18mm. Manual focus is nearly impossible without using the camera's live view function. Good for kids, easy/cheap to replace. Gives an intro to SLR Lens. IS works, IQ is okay. This one is "el cheapissimos sweet sister". The IS version of the most common kit lens ever. If you are lucky, you can find this one instead of the much worse non-IS in a kit for only very few extra money. 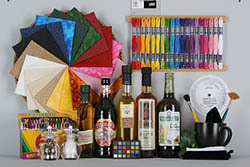 It's a good base to start with an DSLR - good image quality and (as having IS) easy to handle. If you try to sell it once after you got a better one, forget it: eBay is full of people, who had the same idea. All plastic but thats OK as kit lens. I used this lens during my trip to Vietnam and Cambodia this year. Not so bad lens for a price. I loved IS performance and was satisfied by image quality in most situations. Build quality is a weak point. Manual focus ring is almost useless, overal construction is loose and weak, rotating front element is annoying. Let me just start with saying for the price, this is probably the best bang for the buck lens that canon makes. If you are still shooting with the older Non IS version of the 18-55 you should for sure upgrade. I Have used both and the IQ of this newer lens is much superior. Add the newer 4 stop IS to the package and its not even in the same ballpark. The newer Image Stabilization is also much quieter than the older generation IS which is nice since the older louder ones could be somewhat distracting. You can also get some surprisingly good detail shots of closeups of flowers, butterflies, etc due to the fairly close min focusing distance. The lens if very light partially due to its plastic mounting ring, which really doesn't bother me on a lens this size and it makes it a more carry-able. If you do a lot of hiking with camera you will appreciate this. The build quality: I have seen worse but it would have been nice if canon would have made the manual focusing a bit nicer, smoother etc. The end of lens which is also the manual focus ring feels somewhat loose in camera ( which is fairly common for this price lenses ). I know that most if not all lenses in this price range are built in such a way that the end of the lens turns during focusing but for people that use filters & polarizers etc this is very annoying. It would be great if canon would make a small light lens like this but step it up a bit with a little better build quality and non rotating front ring. I prefer this lens to the Tamron 17-50 f/2.8 because this lens focuses accurately and quietly. Unlike Tammy, it's noisy and always missfocus. Plastic mount is OK but I prefer metal mount (at least metal looks better than plastic). If you look at the price, you can complain nothing. I'd say this one has excellent image quality especially at around 24mm. Considering its price, it's an amazing deal for such an IS-general purpose zoom. It is light-weighted. And IS really makes a difference . The major thing is it has a small aperture, [email protected],[email protected] So it's great for landscape but not for portrait. Concerning the build quality the focus ring really is not very easy to use. It's light, cheap, and gives great results when used correctly. Good bang for the buck. Image stabilization mainly helps out at 55mm in low lit conditions. I've tried using extensions tubes with this lens on my 20D (12mm, 20mm, and 36mm Kenko EF/EF-S tubes). barely useable. ~1 inch working distance. Poor magnification. decent results. ~3inch to 12inch working distance. At closest distance, I can fill the frame with 1.5" subject. 20mm tube. The working distance drops to 0" at 24mm. 55mm gives a working distance of between about 2" and 8" across the focal range. At closest distance, a 1" subject fills the frame. 36mm tube. At 55mm the working distance is about 1.5" to 4.5". At closest distance, a 0.75" subject fills the frame. This is a great small, all-purpose zoom at the right price. Image quality is quite good (much better than the 17-85 it replaced for me). It's also the cheapest way to get IS... and I wouldn't do without that on a slow zoom. I find the size and weight more convenient than the 17-85 : this is a lens I can bring even if I'm not sure I'll use it. I usually carry it in case I'll need something very wide or if I just want to take one lens for casual photography. I can't really comment on manual focus as I simply don't use it on that lens. The images it produces are ok for a zoom. Distortion at wide angle is easily corrected with the latest DPP software. I was skeptical of a entry level lens; however I was proven very wrong. Great kick-around lens. Its light, compact and has great performance. The only thing you need with this lens is a UV filter and considering its image quality you might want to buy a higher class B+W filter versus a cheaper UV filter. I've previously tried my friend's EF 24-105 f/4L IS USM and I'm amazed that this lens can do almost the same speed as that USM on a L lens that is about 8 times more expensive, though it is quite noisy. Build quality really is good, nothing's breaking up, at least, the only down is the focus ring, it somehow dig into your finger while you try to operate it. Remarkably good image quality, light weight. I'm amazed. Really good image quality from 18 mm to about 40 mm. It's still pretty good at 55 mm. I bought this lens to extend the wide end of my 28-135 IS lens. Image quality is every bit as good as the 28-135. I also found the close focus to be excellent. The construction is all plastic and the front end wobbles a bit. I really wish it had a metal mount, but given the price and image quality it's an acceptable trade off for a compact and light lens, as the stress on the mount is much less. Build quality and focus motor. An excellent new lens from Canon, nice one guys. Ok being picky it has a bit of barrel distortion at 18mm, and it has a teensy bit reduced contrast compared to some other lenses in it's focal length range, but hey it's just a hundred quid! The IS is excellent too, quite effective, which just adds the icing to the cake. If you're looking for something in this range, and you don't need f2.8 or the extra length of the 17-85 or the sigma 17-70, look no further. This one is a no-brainer. i've had the previous non-IS 18-55mm kit lens and the difference is huge. i heard from this site that the image quality was better, then checked canon's web site. they claim a better MTF so i tried it. the salesman at the camera store said he could immediately tell a difference by looking through the lens and that it had more contrast. i've done some tests on it and compared it to the 24-105L's weak focal length (105mm). this lens was much sharper at any focal length at f8 compared to the 24-105L at f4. it's amazing that this lens is only $200 and also has I.S. i wish canon would improve the build quality and make it a little stronger, even for $50 more; at least a metal mount. overall, it's an awesome lens. photozone.de also just released a review and rated it excellent. this lens will outperform many "L" lenses believe it or not. I got this lens recently, but have not used it enough to make a good eval of the IQ. Have noticed however that the IS is much better than expected. Disappointed that the build quality does not seem any better than the original kit lens. How much would it cost them to use a metal mount? Most of us would pay an extra $10 for it. uwalover -- can you explain to me why someone would have THREE lenses which cover the same focal length range? There are a lot of people going to bed hungry tonight if the money is just burning a hole in your pocket! light , fast AF, very powerful IS, sharp , cheap. I bought a 40D 4 days a go with this lens. This is an amazing lens , very light , sharp (for its modest price tag)with powerful IS. Canon's claim of 4 stop effective IS seems really true , this IS works well like the one on my 70-200f4LIS , and is definitely more effective than the one on my 17-55IS. I thought about I would sell the ISed kit lens since I've got a EF-S17-55f2.8IS, but I will keep it for those days I want to go out light.........I also have the Tamorn 17-50 , which I also like. The IS and digital sensor tech will change all , and eliminates needs for the F2.8. Many people think F2.8 is so much better than F4 IS(so they are comparing 24-70L against 24-105LIS) in low light, I 'd say do not underestimate the IS , it is better than the one stop advantage of f2.8 over f4 most of times, thus, I do not use any non-IS lens in low light since my low light work requires lots of DOF, not the shallow F2.8 DOF. That said , the 17-55f2.8IS is a super sharp lens and I need it for my work such as event photographey and weddings........other wise , I would not have bought it............I think most of people do not know what they really need for their photographing stuffs.......................so many of the 17-55IS or 24-105L are always bought by complete beginners who do not even know what lens they actually need or like and asking it at many forums. I think if you do not know you will need the 17-55IS or 24-105L with EF-S10-22 combo , then you wont' need any of them and so get this 18-55IS instead. The 18-55IS and 17-55f2.8 IS are completely different kind of lenses and so you 've got be careful.....................I have had both but I think most of photographers who can even no decide what to buy do not nee the latter the f2.8 IS........but those of you who are just starting out should buy this IS kit lens with a good flash. UPDATE: one moron from DPreview.com Canon lens forum complaining about credibility of my review (he thinks it is not out yet), well I am woring in Japan and it's been out there for 3 weeks already. The moron also said the IQ of the lens could not be 10, well , it is for the price rating, think about it , it costs only 130 US as you buy it as a part of a 40D kit. I rate all lenses accordingly to their prices. So I am not saying this is rated 10 and the 17-55IS is rated 10 , so they are the same in absolute IQ , but considering their price dfferential , there is no way not to rate both of them 10. And the same moronic guy also said to a guy asking about this lens in comparion with the 17-40L , wait till a pro review out .........and what laughable about the moron was , he suggested to look at photozone.de, which is the most careless and unprofessional review ever. Why morons can just trust theri own eyes but need some one to justify what they have chosen was right, what a insecurity is it?